New World Notes: Making Second Life's User Interface Noob Friendly: What's Your Favorite Feature From Dusan's Contest? Making Second Life's User Interface Noob Friendly: What's Your Favorite Feature From Dusan's Contest? As M. Linden himself acknowledges, Second Life's user interface is an imposing, intimidating, overly complex beast that contributes greatly to the world's 90% dropout rate. He says the company's laboring to improve the UI, but third party developers and entrepeneurs who depend on the SL platform are also attaching that problem. Today at 2pm SLT, metaverse consultant Dusan Writer will be in-world on the Metanomics show to present a L$800,000 award for a new "noob friendly" user interface for an alternate Second Life viewer-- details here on the Metanomics site. His bounty contest received numerous entries, and is often the case, individual elements from different submissions stood out. I asked him to share some of them-- take a look after the break. Which one do you think would do most to improve the Second Life experience, both for noobs, and for veterans? Damien Fate introduced the idea of a viewer where, with the click of a button, you can toggle between a 'simple' and more complex viewer. McCabe Maxsted rethought the prim editor, including 'windows' showing x/y/z coordinates and path cuts. 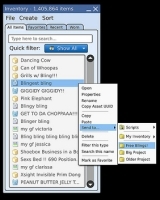 Jacek Antonelli introduced a more robust inventory management system that allows you to sort, filter, tag favorites, and 'send' items to others or to folders. Roy Cassini added context-specific help, in particular for new users. Mini tutorials built into the viewer give instructions on how to use interface features. Rheta Shan created 'benches' for different functions - building, for example, or social. In this example, a work bench for taking photos and videos shows how the concept works. Vincent Nacon devised a menu within inventory for sorting, seeing and managing object permissions using a tick box system." My favorite aspect of the SL interface is its richness and complexity. Make it simple = make it boring. A year ago, though, I did suggest on the jira that we might benefit by being able to chose from different viewers (http://jira.secondlife.com/browse/VWR-1030) - not being relegated to one simplfied version, but having viewers with different toolsets and so on as the focus. M, the UI isn't "overly complex." "My favorite aspect of the SL interface is its richness and complexity"
Are you sure? Don't you mean your favourite thing about SL itself is it's richness and complexity? An interface that is complex is, more often than not, a badly designed interface - a good interface takes complexity and presents it simply and logically. I agree with you we should never dumb-down SL to fit a simpler interface - but we certainly need to rethink the UI and how it presents all the choices SL offers. Were I religious, I'd pray that the SL client not move to an icon-based interface. What is an obvious relation between picture and action to one person isn't to another... assuming that one can make out the detail (just what is inside the IM word balloon that distinguishes it from the chat word balloon?). Context-based help and a better inventory system would be wonderful. Regardless, the current interface is far from perfect and scares away new people. Whoever says that the interface is good being complex is not thinking about anyone else but current users of Second Life. Take a look at the iPhone. There is a better chance that a person new to a cell phone would be able to use the iPhone easier than say a phone using the old style of dozens of context menus filled with unknown options. I'm not saying picture icons is the definite way to do it, but I'm saying that we must change SL to faster/easier to pick up and go from a new user's point of view. I think any interface design to be thought up should consider screen real estate as an extremely important factor to take into account unless it is designed not to be such in rare cases such as the Preferences/Settings menu. I actually had to scale down the UI for my needs. The suggestion of the prim editor was a total shock of wasting such estate for 3 pointless images and expanding the menu towards the centre of the screen. Jacek's suggested changes to the inventory system look pretty spiffy. I want a Send To option and a way to mark favorites! :) Thanks to everyone who participated for helping us imagine more ways to improve the interface. I think the biggest problem with re-designed the client interface is the fact that we are kind of stuck with things the way they are. No matter how you shuffle things around and spiffy up the icons, we are still left with an inventory, chat windows, building tools, etc. Unless the underlying infrastructure is changed (not suggesting that it should), the interface must stay fundamentally the same. Takafumi makes a good point about screen real estate. I think a goal should be to free up the screen. Give us the most available viewing area until we need to use a tool or window, then make that window as minimal as usability allows. It looks like Rheta might feel the same way. From what I can see of her entry it is very sleek and slim, conserving lots of space so we can see our virtual world. I'm hoping that LL continues with the idea of making the interface more malleable. An easy to skin interface would be fantastic. Customize your own or pick from dozens (hundreds?) of skins made by other residents. Takafumi, that's why I said we would benefit from several different kinds of UI. I think new user, social, building, and so on clients each with the same tools but just with different focus (say the social might have building tools less accessible) would be useful. I don't know that it's possible - maybe it isn't. Eris, the possesive form of "it" has no apostrophe. I would really like a stop button. As in 'No SL, I really don't want to walk into that wall or fall off that cliff'. If the object is newbie love, I'd suggest easier movement controls should be the first thing done. The inventory proposals are brilliant, especially the idea of transferring items to nearby avatars without having to click on their bodies. I'm not at all sure about taking up extra real estate for the builder icons. The gain is marginal and the loss of screen space is not. The builder tools need attention (can we please just bend prims) but I'd think they're not likely to hit a new entrant in the first hour. All the concern about the 'difficult for newbies' UI is beyond me. The UI was the most familiar thing about SL for me when I was brand new. Drop down menus called File, Edit and View? Pretty common stuff, aren't they? The UI seems less complicated than Excel or any garden variety word processor, in my opinion. Maybe the one and only 'game' experience common to all residents is learning where the 12 or 15 or 20 commands that you are interested in are located. Good point Corcosman. All of the individual elements should be familiar to anyone who is comfortable with other programs. Maybe it's just the fact that there are so many tools and options that throws people off? Or maybe it's the moving in 3D space. Anyone who is a long-time gamer is very comfortable with movement in a simulated environment. I took to the movement controls right away, just another variation of the wasd setup. Yet I see some long-time residents who struggle with simple camera controls. I think..the tutorial needs to be better imho. The tutorial doesn't even explain these different methods of camera and avatar movement, or does it? I personally think the integrated tutorial by Roy Cassini is truly the winner out of those interface option for noob-friendliness. "All of the individual elements should be familiar to anyone who is comfortable with other programs. Maybe it's just the fact that there are so many tools and options that throws people off?" The format is familiar but all the individual commands are particular to Second Life. And, as other comments point out, in many instances you've got different methods of achieving the same action. Lots of options. At first glance, it does look like a ton of stuff. It's definitely a shock. But, I think, that only lasts as long as it takes someone to start going through some of the commands. If I recall correctly, it all became a lot less imposing after ten minutes or so for me. I found a few basic things and decided "later" for all that other stuff. #1 skill that makes life easier for new people? Camera control. Alt + the left mouse button. No more walking right up to textures trying to get them to rez. Fortunately, I had watched video tutorials before ever opening an account and had a vague idea of how things worked the first time I logged on. I imagine for someone with no game experience ( like me ) and not having looked at tutorials first, SL might seem incredibly difficult at first glance. Very easy to say "forget it" if you are struggling to do anything at all after 15 minutes or so. Alt-zoom and all the camera control options should be the first thing taught in a newbie tutorial. Can't enjoy the world if you can't move around and look at it. I've been using the wasd controls since day one because that's what I'm used to. Can't stand having my chatbar open all the time. Just hit Enter, type, hit Enter. Seems natural to me. I think a toggle between a beginners viewer and the 'normal' viewer is a good idea. I think it is a bad idea to change the current 'complex' editor to make it easier for beginners. All changes made recently are a disaster, if you ask me, because all in all, the viewer is just a tool to have a second life. Changing the tool takes away focus off the real thing as one has to adapt first to the tool again. A beginnersviewer only has to have navigation controles, a leftclick objects option and general chat options. As that is what all newbies are doing the first days. Having to go through a place before being able to be in the real grid is the biggest mistake to my opinion. An easy way to go to guided beginners sequence is ok, but not being able to be in the world right away is a mayor downside. Especially since Linden made this startplace so complex that even an experienced user has to investigate to get its alt through it. I hope for a time, soon, that you can enter the 3D internet first and then worry about learning things. Just like how it works with a 2D browser. Having to create a username first, before you can go in, is also a step that holds people back. The creaters of the 3D worlds should watch the 2D world much better to not scare so many people away. How many of you experienced users decide to leave a website again because you cannot do anything before signing up? The step from browsing the internet with a 2D viewer to being IN the internet with a 3D viewer is still way too large and complex.